Glasgow Montrose. A Chess Club in the West End of Glasgow. Meets Thursdays, Novotel Hotel, 181 Pitt Street, G2 4DT (Google Maps). Please note that the club is in Summer Recess. We will be back on Thursday 4th September – see you then! If you want to join, come down and give it a go – there’s no obligation remember. Glasgow Montrose Chess Club is based in the Woodlands area of Glasgow and has been since 1990 when it moved from Possil bus depot (a real palace!). 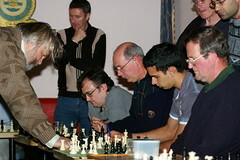 In addition to our 2 teams playing in the Glasgow Chess League, we run a team in the Dumbarton League too. Photo: The Yusupov Simultaneous, held on 28th Sept. 2006. Click to view larger (flickr.com). Every weekend i used to pay a quick visit this web site, for the reason that i want enjoyment, for the reason that this this web site conations in fact good funny data too.